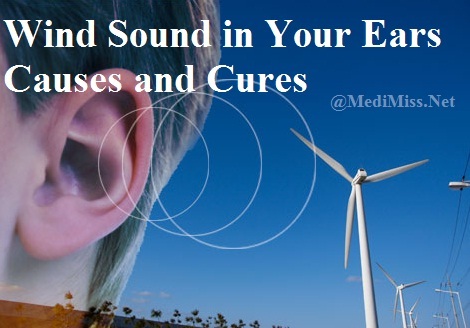 The wind sound in ear drums can be very annoying. In most cases this leaves you feeling clogged and quite irritable. There are many causes of this and cures also come in various forms. Let me quickly provide some useful insights into this problem. Just read all these points right to the end. · First of all this may be caused by your nose being clogged up. I this case you may need to drink medication that treats allergies. You can see a pharmacist to help recommend something you can take. If your nose is not clogged up read on. · Chances are you have ear wax. If you have are like some people then your ears probably make ear wax way too much. In this case you might have to see a doctor. What he or she will do is use a syringe and some warm water to flush the wax out of your ear. If you do not like this option or feel like it is not relevant then try hydrogen peroxide. Read about it below. · I normally do not recommend this one but I have seen other people use it by lying on the side and adding a cap full in the ears. · If none of these can't stop the wind sound in ear drums or feel like they won't help then you probably have Tinnitus. This is basically an irritating problem whereby your ears keep ringing even when everything around you is dead quite. While some people define it a humming or buzzing sound some just call it a wave of oceans or wind. If not treated this problem could escalate and complicate.